Fenced dreams is a walking performance. With a large group of performers and volunteers, the performance takes the audience on an experiential journey, zigzagging through the gardens of the Kaarela area. The performance starts in the local square in Helsinki suburb Kannelmäki, where the audience is divided in 6 different groups and they get instructions and headphones. Each group is led by guides in different pathways though private and public spaces and gardens. The different paths of the performance all lead to a common party in the Malminkartano apple orchard. 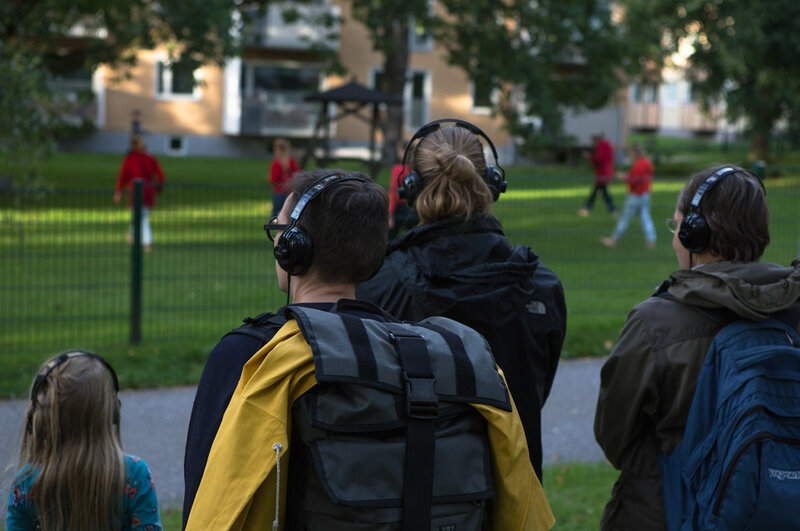 During the walk, the spectators listens to a soundscape on headphones and encounter performative events. Sound design of the performance uses local environmental sounds together with music and text. In Fenced dreams, the spectator is an active participant, choosing which way to watch, where to position oneself. While experiencing the performance, the lines between performer, spectator, environment and performance start to blur. All the people, everything in the environment and all the senses become part of the performance experience. Performance deals with our relationship to our environment, our boundaries, fences and limits through experiencing the walking, movement, music and text. Fenced dreams performance adaptation is available for different environments and cities. Performers: Pekka Louhio, Mikko Perkola, Marjukka Savolainen, Elisa Lejeune, Pauliina Kyttä, Anni Mäenpää, Annina Vana, Niina Virkkala, Kirsi Verkka, Anne Harju, Hanna Toiviainen-Conteh, Ella Silvennoinen, Risto Railo, Riikka Levonmaa, Antti Hovila, Juuli Lappalainen, Sari Heinonen, Noora Laaksonen, Päivi Korpela, Vappu Tuomisto, Heli Uusitalo, Satu Riikonen, Päivi Luoma, Marjaana Veikkanen, Pihla Auvinen, Reetta Lindberg, Ida Ticklén, Vilma Mankonen, Eelis Sunila, Minttu Heinonen, Onni Niemi, Pauli Kalalahti, Pyry Varvikko, Sofia Johansson, Vappu Virkkula, Kaarlo Kilponen, Lilja Nevalaita, Kerttu Kapiainen, Kia Kärkkäinen, Nelma Manninen, Klaara Kolehmainen, Sofia Sundman, Netta Morottaja ja Siiri Finnilä. Guides: main guide Anna Koskela, Saija Jäntti, Laura Lehtinen Anne Pietarinen, Janna Hujanen, Katja Kirsi, Veera Räsänen, Tuula Suitiala, Jari Laine, Pertti Andersson, Jenni Koistinen, Ida Teeri ja Netta Jousi.